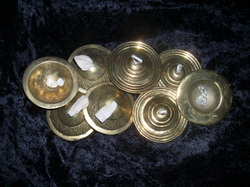 Finger cymbals are a percussion instrument that is often played by dancers. There are two basic types of cymbals and they use different techniques to play them. The cymbals I use in my classes are the Turkish Zills (or Zils). These cymbals are made of silver, brass or bronze that is relatively thin. They have two slits in the top for flat elastic. You are going to play your cymbals A LOT so I strongly recommend spending the money to get a good set. They should come in a set of four (I've seen them sold in pairs at local music stores, so make sure you are getting four). I feel that Saroyan cymbals have the best sound, but be cautious when purchasing them anywhere but direct from their website. Occasionally you will find inferior cymbals being sold as Saroyan. If they don't match one of the designs from the website I wouldn't purchase them. If in doubt feel free to email me to take a look at what you've found. 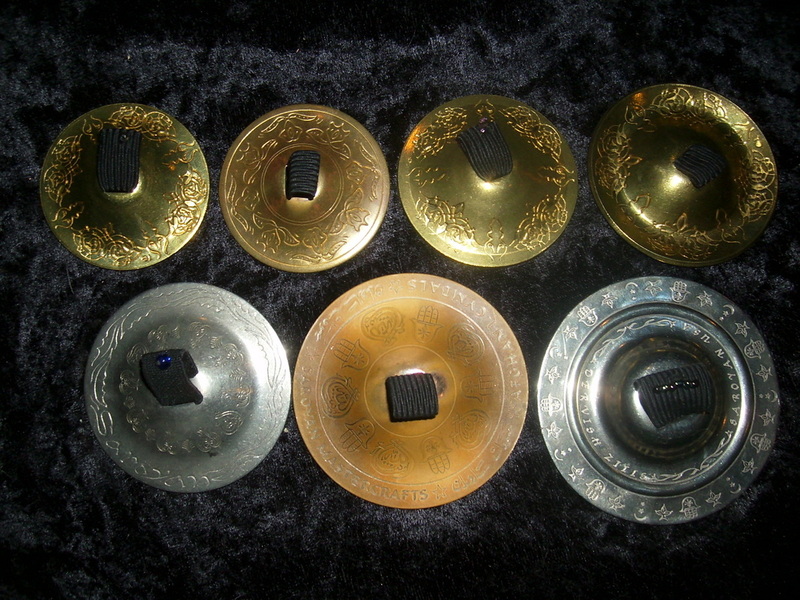 Zills, top row left to right, all in brass: Turquoise size A (2 1/16"), Saroyan Arabesque (2 1/16"), Turquoise Size EB (2 1/4"), Turquoise Size B Turkish (2 1/2"). I recommend students purchase "student size" zills which are 2 1/16 to 2 3/16 inches in diameter and weigh 100-110 grams. You can purchase appropriate size/weight cymbals from Saroyan Zills. You can find them on the "finger cymbals for students" and the "modern and contemporary cymbals" pages (though Arabesque are on the professional page, they are slightly heavier, but should be ok for learning). Once you have learned the basics on smaller cymbals you can progress to larger and heavier zills. My troupe uses silver Saroyan cymbals which are 2 3/8 to 2 5/8 inches diameter. For teaching I use cymbals which are 2 3/4 to 3 inches in diameter. Generally speaking, the larger and heavier the cymbals the louder they will be (which is why I play large cymbals when teaching, so students can hear my cymbals over everyone else's). I do not recommend the tinker zills or mini zills except for young children. They are too small to develop the necessary strength in your hands and forearms for proper cymbal playing and actually make some of the strikes more difficult because of their small size. I have small hands and can play 3 inch cymbals, so even if you have small hands, you should be able to play the student size zills. If, for some reason you don't want Saroyan zills (or just can't find them), my second choice in finger cymbals are the ones by Turquoise International. You will want to start with size EB or size B. Size A would also be ok, but have a high tinny sound. Usually you play a matched set where all four cymbals are the same size/weight/material. Occasionally dancers will wear an odd cymbal on the thumb of their left hand which is in a higher pitch than the other three. This means when they play rhythms it sounds more like the rhythm sounds on the doumbek without having to use different striking techniques to achieve different sounds. You can find DVDs and CDs which teach Finger Cymbal technique on the DVD Recommendations - Finger Cymbals page. The video below is one I found on Youtube that shows the proper way to sew the elastic in your zills. I would add that you can sew a small bead or sequin to the center top of the elastic on the cymbals for your thumbs so you can quickly identify if you have a thumb of finger cymbal when you go to put them on. Some people use a dot of nail polish on the inside of the cymbal or just use different colors of thread to sew the elastic. The Egyptian style of cymbals are called Sagat. They are made from heavier/thicker metal and have a single round hole through which round elastic is passed. I do not play sagat, but the picture to the left shows two sets of sagat. For more information on how they are played I recommend Yasmin Henkish's CD (link to the right). You can purchase it direct from her if you prefer, she also sells sagat on her website (scroll down to the bottom of the page for the sagat). For more information on how Sagat are different from zills you can check out Yasmin's article at the Gilded Serpent. Practicing with your finger cymbals is a must, but sometimes you need them to be quiet. I've found two patterns for zill mufflers you can crochet. The first comes from Shira and can be found on her website. The second makes a ring that fits over your zills and can be found here. There are other patterns out there, so if you don't like these just search "crochet zill mufflers" and see what you find.